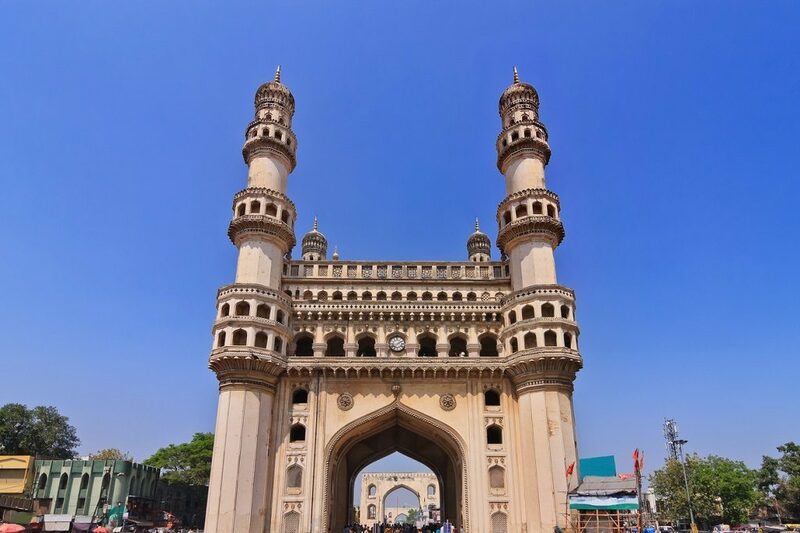 Hyderabad in 4 days - Everything to do on a short trip to the Nawab City! Hyderabad in 4 days – Everything to do on a short trip to the Nawab City! City of Pearls. City of Nawabs. City of biriyani! Think you can cover Hyderabad in 4 days? But of course! Maybe not in its entirety but definitely the parts that matter the most, read on. Call it what you like but the fact remains the beauty of this city cannot be just contained in words. 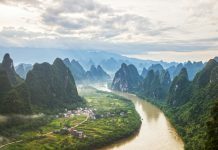 As soon as you set foot in the streets and galli bazaars of the Capital City of Telangana State (and de jure capital of Andhra Pradesh), you’ll know what you’re bound to see during the rest of your trip. 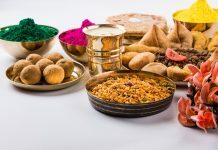 The oh-so-well-known Hyderabadi-Hindi dialect, the laid-back attitude, being a complete foodie or celebrating without any reason with a bunch of friends is what differentiates a Hyderabadi from the others. The place has created such an influence on its culture and people that one can easily identify a Hyderabadi from a large group of people. The monumental preserves, Pearls, the Hyderabadi biryani, Irani chai is what describes this city of Nawabs. So much to see. So much to explore. Why not take one at a time to soak into the ‘travel feels’ in Hyderabad. The architectural enthusiasts will LOVE it here because Hyderabad is a city that will keep you coming back for more! Here’s your perfect itinerary of Hyderabad in 4 days! On arriving at Hyderabad, and cooling off all the while getting accustomed to the climate, you can map out the things you could cover in the best way possible. And here’s a handy guide on how to commute in Hyderabad. You could begin your tour by visiting the beautiful monument, Char Minar. With four huge gates, Char Minar is the oldest mosque in the Hyderabad. It is a classic example of Catia style of Islamic architecture. It is built with a wide variety of stones like marble, granite, mortar and limestone. The grandeur of this structure will leave you awestruck. The beauty does not simply lie in its structure, but also in what the structure means to the people and its symbolic importance to the residents around the architectural marvel. The mosque is always filled with people offering prayers in good faith. Bustling with energy, the vibrancy of the place strikes you the most. There are innumerable shops selling everything from antiques and glittering bangles to bags and toys. Strangely imitating almost every bit of the mosque in Mecca Madina in Saudi Arabia, this is the biggest Mosque in Hyderabad. 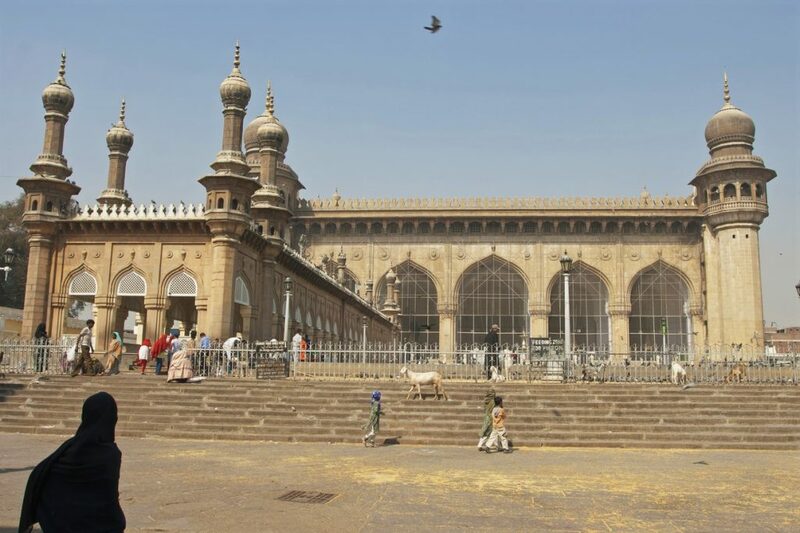 Being one of the largest mosques in India, it can accommodate thousands of devotees at a time. One can see a huge pond of water and two stone benches that are mounted near the entrance as well. Legend states that if a person sits on these benches, he/she will return to sit on these benches again alive or dead! Can’t say for sure it’s just superstition, but then again, who knows? 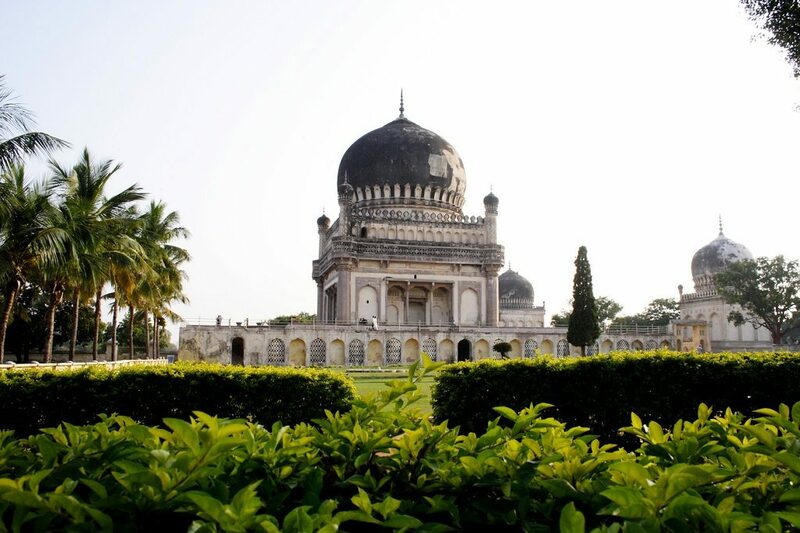 The Qutub Shahi Tombs are literally an architectural marvel amid the picturesque gardens of Ibrahim Bagh in Hyderabad. The Qutub Shahi Tomb, which represents the architectural tradition of the Qutub Shahi dynasty, is truly a one-of-a-kind masterpiece. What surprises you the most would be the secularism with which the buildings exist- tombs are set up in different styles, depicting Hindu, Persian and Pathan forms all together! Having been built by industrialists Birlas themselves, they sure knew how to deal with not just business and money, but also with infrastructure and aesthetics. Drawing admiring glances from every passerby, Birla Temple (or Naubat Pahad) stands magnificently in all its grandeur. The temple blends three different architecture styles – South-Indian, Utkala and Rajasthani. Settled at an altitude of up to 280 ft, the temple offers you a breathtaking view of the city. Academic Journals. Rustic weaponry. Precious royal items collected through centuries of different kingdoms. Intrigued and attractive to its rich history, you’ll be pulled into it. 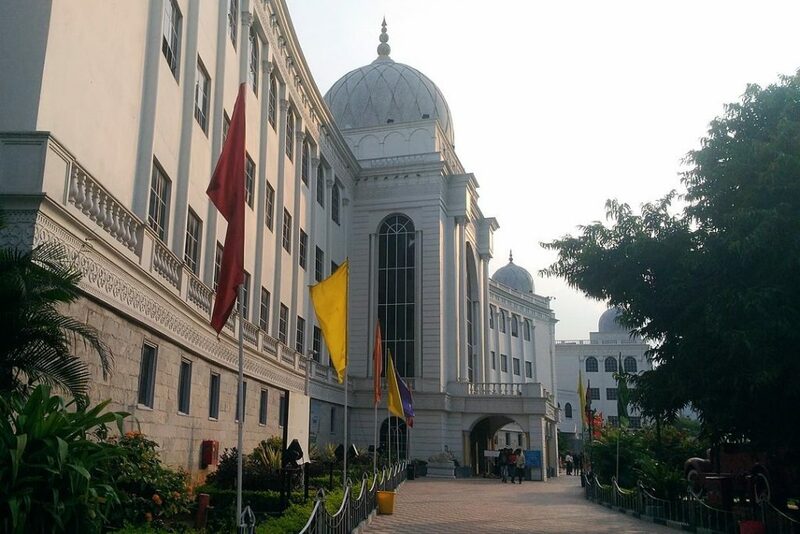 Salarjung Museum is basically a storehouse of various historic artefacts of the entire nation – India. The collections include several Jade daggers belonging to Emperor Jahangir, Noor Jahan and Shah Jahan and the wardrobe of Tipu Sultan. 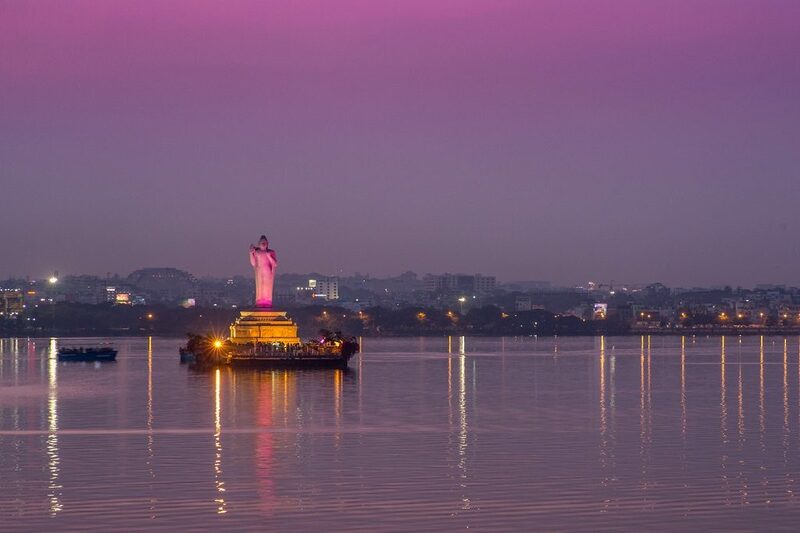 Hussain Sagar in Hyderabad, India. Apart from the touristy boat ride at the Lake, soothing your mind and soul, this is one among the pristine lakes of Hyderabad. During your ride, you can also see the huge statue of Buddha standing on the ‘Rock of Gibraltar’ in the centre. 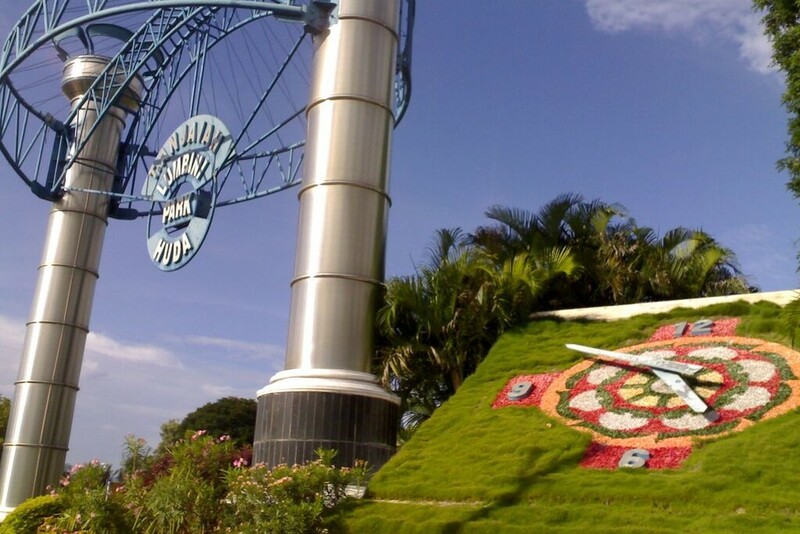 The concept of a large, colourful clock designed using flowers is unique and alluring. The landmark of the park is the large statue of Lord Buddha. Sculptures include the life story of the Lord. So not only is a trip here pure fun-based but educational for kids and adults too. At night, with the orange lamps and laser light and musical fountain glow, the Lumbini Park glows beautifully in magnificence. Laser Show at Lumbini Gardens. It is one of the prime attractions, where you get to see the water shoot up in the sky, making a full wall sized water screen. 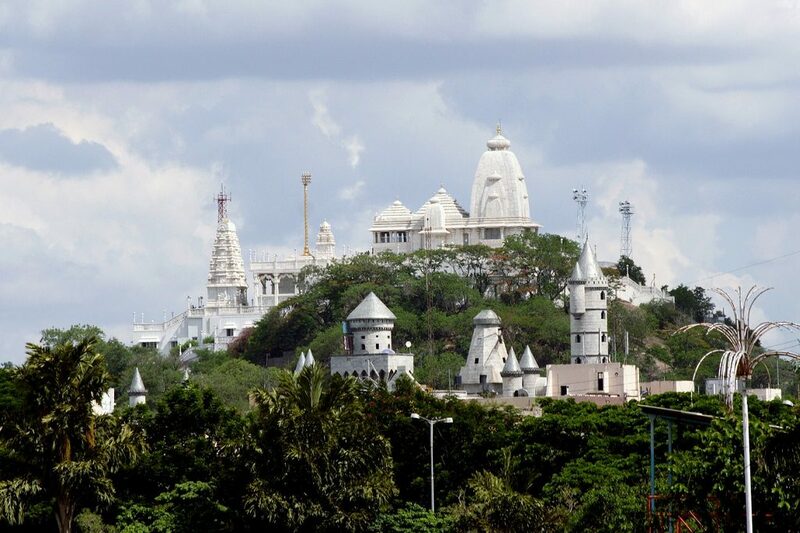 It is a beautiful holiday get away with cinematic themes in the happening city of Hyderabad. There is so much for you to see, learn, and experience as something new comes towards you from every nook and corner. Feel your Bollywood dreams come true- at the Ramoji Film City, l you can indulge in a number of activities ranging from film city tours to adventure sports, toy train rides to a number of gardens, a small but cool entry into the filmy world. Smaller replicas of famous monuments in the country such as the Amer Palace are also present here. What’s more, you can also stroll through a number of other sets and settings such as royal courts and other locations which have drawn inspiration from different architectures throughout the world. There are a number of films directed here in different languages; whether Hindi, Telugu, Malayalam, Kannada and Bengali. Be sure to keep aside an entire day for this fun-filled location! It’s an add to cart kind of day because it’s time to shop in Hyderabad! During the British rule in India, this place was called Residency Market. Everything from silver junk jewellery to rare collection pieces, this market is a one-stop-shop for shopping in Hyderabad for all the ladies out there. The colourful stylish Indian salwar kameez and churidars with dazzling footwear displays have something for each taste. The market has row after row of shops that display the Hyderabad with finesse. Before you venture out for shopping, brace yourself for a long day. The entire collection on offer is mind-boggling and the amazing deals you can get here will surely confuse you. Street shopping in Hyderabad at its best! Some of the good things about Shilparamam are that it is a gated complex so once you are in there are no beggars to trouble you, no noise from cars and no smoke from autos making you wonder how banning of smoking in public places came about to be implemented. But when it comes to shopping there’s a whole lot more! Indian handicrafts like Bidri metal work from Bidar Karnataka, bandhani work from Rajasthan, paper Mache from Kashmir, bamboo work from Manipur, Brassware from Moradabad in UP and for sure – pearls from Hyderabad- can all be found in every nook and corner of the street. You WILL have to be smart and try for a hard bargain as the typical price quoted is more than what the guy will actually sell for. 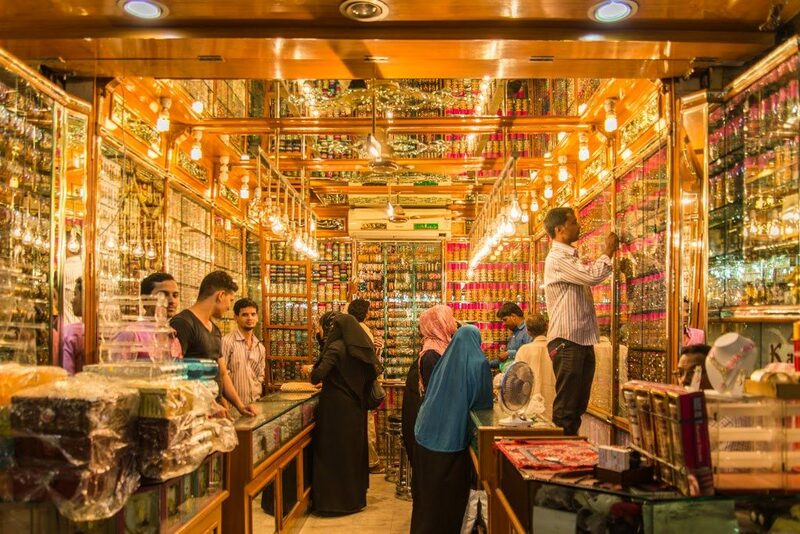 Situated next to the Charminar, Laad Bazaar is located in a street packed with shops selling perfumes, textiles, and jewellery. This market is the go-to place for wedding shopping in the city. Some special artefacts and jewellery are hand-crafted lac bangles, which are produced in local workshops and embellished with glittering, colourful stones. The shops stock brass and silver bangles studded with pearls in abundance. One should be smart and skilful in dealing with such items, as they get cajoled sometimes. The star attractions of the place are the footwear stalls. Though the source of the shoes remains a mystery, the traders say they buy it from cobblers or from discarded lots. Old scrap items, which include typewriters, telephones, automobile parts, are available at a throwaway price. Chill at Hussain Sagar lake, Lumbini Park, or you could go watch a movie at Prasads and later enjoy a bite at Eat Street. For kids, there are fun rides. It will seem like a mini entertainment park right in the middle of the city, beside a beautiful lake. The old city is a haven for you if you are a shopaholic, this is the place to shop for pearls, bangles, and dresses. The only thing you must have in your arsenal is the ability to bargain with the shopkeepers. Hyderabadi Biryani, perhaps the most well-known Non-Vegetarian culinary delights from the famous Hyderabad Cuisine. It is a traditional dish made using Basmati rice, goat meat and various other exotic spices. Just the aroma of Dum Pukht dish will leave you drooling. Dum Pukht Biryani is a core Hyderabadi dish cooked with steam. As you take a bite, you can taste the rich flavour of desi ghee melt in your mouth. It is a process of slow-cooking in a sealed ‘handi’, which allows ingredients to mature in their own juices, retaining their rich flavours while releasing aromatic aromas. What’s a better way to start your meal than a spicy-meaty soup? Super light texture, prepared with tender mutton, it is the perfect starter that will keep you hooked. Your visit to Hyderabad is incomplete without having Hyderabadi biryani. This is such a popular and favourite dish amongst the locals, people don’t mind having it for breakfast, lunch or dinner- maybe all three times as well! With Hyderabadi chicken biryani, you just can’t get enough of it. The phrase ‘enough of biriyani’ just doesn’t exist. Mouthwatering and authentic, this Indian dish with succulent chicken in layers of fluffy rice, fragrant spices and caramelized onions is to die for! Try the famous Hyderabadi Biryani at Bawarchi or Paradize and you will want time to stop. Or try a cup of hot Irani chai with Karachi biscuits in the evening with your buddies. You’ll not want your journey in Hyderabad to end. End of a trip but not your travel journey! On the last hour of the tour, you can head back to Hyderabad airport. Board the flight for your onward journey with a bagful of memories.